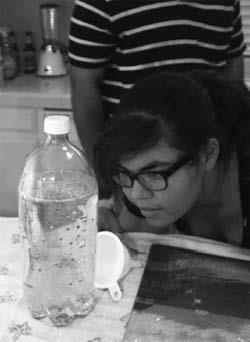 How can I make a lava lamp at home? Note: OK, so we’ll disclose up front that this experiment won’t actually make a lamp. It will make a device with bubbles that rise and fall just like a lava lamp, but you’ll need a flashlight or other light source if you want it to be illuminated. Begin by filling the plastic bottle almost full with vegetable oil. Add a few drops of food coloring to 1 tablespoon of water, and then add this to the plastic bottle’s contents. You’ll notice that the oil and water are not miscible, which is what will allow us to make bubbles within the oil. The water sinks to the bottom of the bottle, since it is more dense than the oil. Ground up an Alka-Seltzer® tablet and add the pieces/powder to the bottle, and then seal the cap. When the chemicals in the table dissolve and react, carbon dioxide gas bubbles will be formed (see equation below), which will lower the overall density of the water bubbles, allowing them to rise to the top of the bottle. When they reach the top, they will leave the water bubbles and join the small amount of air at the top of the bottle. At this point, the water bubbles will again be denser than the oil, so they will sink back to the bottom of the bottle. This process will repeat until all of the Alka-Seltzer® has been reacted. You should see colored bubbles move throughout the bottle, similar to a lava lamp. You can also add another Alka-Seltzer® after the reaction has finished.